Border stencils and Border stencil designs by Cutting Edge Stencils. Border stencils help to frame out a room and give it a nice touch. They look beautiful at the ceiling line or in the middle of the wall. 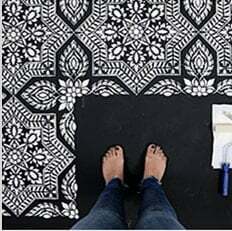 Stenciled borders are perfect solutions for rooms where just a little bit of stencil pattern is needed. Stenciled stripes are very elegant and becoming popular again. They can add height to a space as well as give it a "tailored" designer look. Our border stencils are reusable can be used again and again. Enjoy our border stencil design collection and please watch our How To Stencil Videos to learn a simple stenciling technique.